Everything’s super around the Super Bowl – the football, the entertainment, the hype and, of course, the parties. Another thing that’s big about the Super Bowl, but much less welcome, is the potential for crashing the party with a food-related illness. More than 48 million people are affected by a food-borne illness in the United States every year. 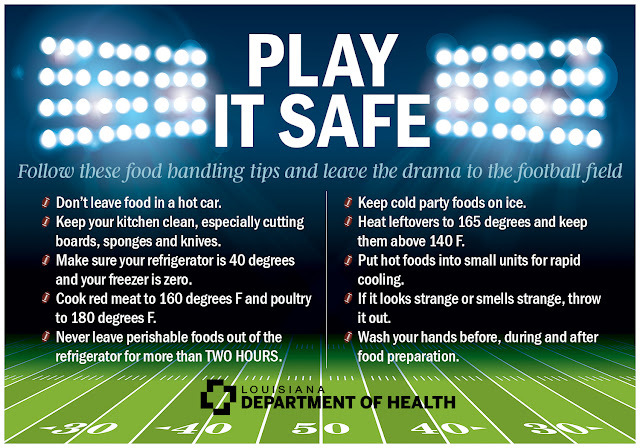 Large parties around the holidays and the Super Bowl, such as those we throw ourselves and those we attend, increase the potential for food contamination. Of those 48 million, an estimated 128,000 people are hospitalized and 3,000 lose their lives due to a food-related illness. Populations at greatest risk for serious, life-threatening illness are the very young, the elderly and those with weakened immune systems. Why do large get-togethers increase the risk for an illness? It’s because we are serving large quantities of food, not paying attention to food temperatures and having many people eat off the same plate or from the same container. All of these factors increase the risk of bacteria – and of the bacteria multiplying rapidly. Individually, each of these food fouls creates a risk. Combine them, and the risk climbs that you or another guest will become ill. Some illnesses related to food include salmonella, E. coli, shigella, hepatitis A, listeria and norovirus. Also be aware of vibrio, which is often associated with partially cooked shrimp or raw oysters, depending on the strain. Symptoms associated with food-borne illnesses include diarrhea, abdominal pain and fever. The federal Food and Drug Administration (FDA) provides a chart of common food-borne illnesses and their incubation periods, signs and symptoms, duration and food sources here. Cook red meat to 160 degrees F and poultry to 180 degrees F.
If it looks strange or smells strange, throw it out. The FDA operates a Food Information Line at 1-888-SAFEFOOD from 9 a.m. to 3 p.m. CT Friday to Wednesday and 11:30 a.m. to 12:30 p.m. CT Thursdays and federal holidays. You can also send your questions to the Food Information Line electronically. The Louisiana Department of Health also provides food safety information at EatSafeLA.gov.